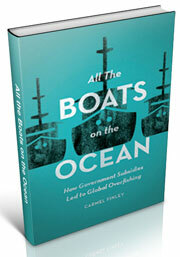 ← So why were those Soviet boats fishing off Washington? In George Moskovita’s book “Living off the Pacific Ocean Floor” he mentions fisherman Jackie Ray. 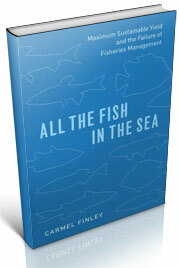 There are certain fishermen who have an uncanny ability to know where and how to catch fish. How they do it is a mystery to me, but one of the ways the trawlers did it was to keep track of where they made successful trawls, getting the net back without hanging up on the bottom, destroying it and losing gear like a trawl door. This knowledge was kept in their heads or might be kept in “a little black book”, which listed successful tows as well as the hangups and snags encountered. It also listed what was taken in each tow, and this information was very personal and secret. When Lee Alverson became the Director of Exploratory Fishing in 1958, he had gotten to know the fishermen by developing a Fishing Log system for the State of Washington Ground Fish Project. It was a volunteer program that he put into effect by visiting each vessel and talking to the skipper, and after he became Director he continued to visit them whenever he had the chance. I accompanied him on one of those when he hired me in 1960. Based on those friendships he developed, he discussed with them where the Cobb should explore for bottom fish. 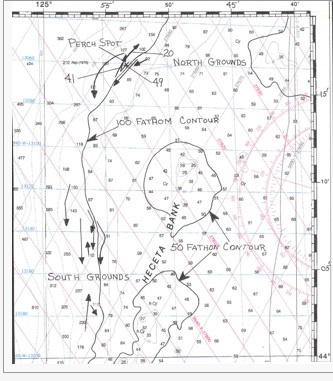 They told him about areas where the bottom was too rough to fish on the continental shelf (out to the 100 fathom contour) and mentioned that once in a while when they tried some of those areas with an old net, if they got the gear back at all there were commercial fish in it. Also that he should explore along the top of the slope deeper than 100 fathoms to determine what species lived out there. On such information Cobb cruises were then planned, and trawlable grounds were searched for on so-called ‘untrawlable’ grounds. The information became public and was put out in an in-house publication called “The Drags of the John N. Cobb.” It showed where snags were located and clear hauls made, along with the dominate species taken. A transparent overlay with the hauls printed on it could be put over the matching navigation chart, transferring them to the chart. 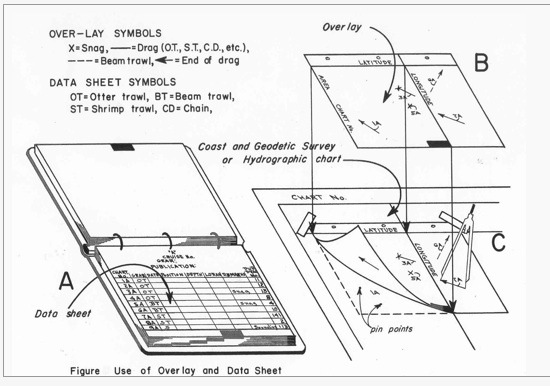 The accompanying figure, “Use of Overlay and Data Sheet” shows how the drag information was transferred. 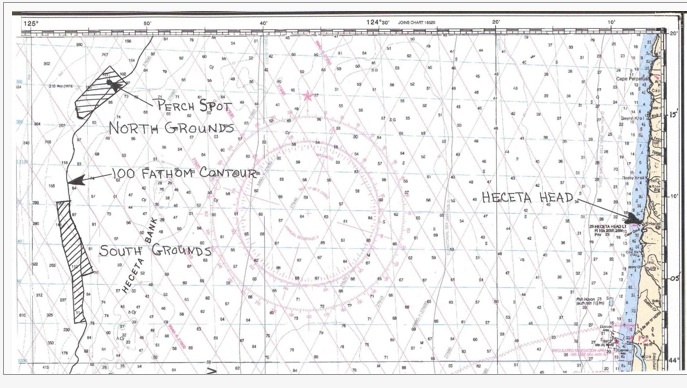 This idea came from the European Fish Charts supplied by the government for the North Seas trawl fleet with drag information printed on the chart. Knowledge that the Pacific coast fishermen had collected over the years was too precious for each individual to pass on to his competitor, but the information that the Cobb collected during the exploratory bottom fish cruises was public and “The Drags of the John N. Cobb” became popular. Any vessel could request to be put on the mailing list to receive the latest drag information. Successful drags were part of the equation and the catch was the second part, the money-making part of it. The fishhouse wanted a certain species and a certain amount and sent the skipper out to find it. Based on the market, it would place a limit in pounds of a certain species of fish that it would buy from individual fishermen’s trips, so the skipper had to come up with the fish that he could sell at the time. This wasn’t easily accomplished, and how certain fishermen like Jackie had the uncanny method of doing it is still a mystery. Al Pruter, Lee Alverson’s newly appointed assistant who was aboard as chief scientist, kept a personal log as part of the cruise data. He called three trawlers working nearby, the Ruth Ellen, Washington and Trego, to let them know the position of the Perch Spot just after the net exploded on Sunday, May 28, 1961. On late Monday he went back to check the Perch Spot and found that a differentvessel, the Madeleine J had fished the spot and had a floater of POP alongside. Checked the Perch spot again on Tuesday and observed the Kiska, Dave II, New Mexico and Oregonian fishing on known grounds just north of there. Talking to the Kiska via marine radio, they reported they had fished the Spot that morning but that small blackcod had set in. He said that some of the boats had worked the spot successfully, but that others had torn up on coral. The Kiska gave them information about a snag made in 116 fathoms in the Spot area, so the Cobb made haul #49 in 117-118 fathoms and snagged during the tow, ripping the net badly. There were 1,500 pounds of POP remaining in the net. On Friday June 2, 1961, on the way into Astoria to pick up Lee and start the AEC project off the Columbia River, Al talked to Gordon White on the Destiny, who thanked him and the vessel for the good work, saying that he hoped that the Cobb would be able to do more work in this area in the future. Cliff Hall on the Pacific Queen compared fathometers and loran readings with the Cobb, saying that he was going to try some of the Cobb drags. At the time, boats fishing out of Newport were on severe limits. 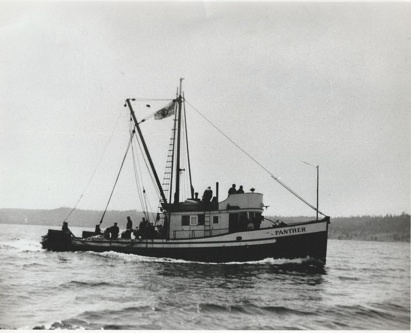 The photo is of the Panther, a typical west coast dragger of the time characteristic of the Oregon trawlers. We do know that trawling grounds found in untrawlable grounds called “The Spit” area off Washington, when the John N. Cobb explored the area on her exploratory cruise the year before, found a concentration of Petrale sole (Eopsetta jordani) in two drags made on May 13, 1960 which averaged 1,150 pounds per hour of fishing. In another area they found Dover sole (Microstomus pacificus) in three hauls made on May 28 and 29, 1960, which produced an average of 2,200 pounds per hour. (2) This information was passed on to the local trawl fleet soon after the catches were made and the Cobb had moved to a new location. The fleet landed over 300,000 pounds Petrale sole and Dover sole from the above areas before the completion of the Cobb Cruise which ended in June, 1960. Fishermen know the sea bottom better than their own back yards and know the behavior of the fish, some better than others. They kept it secret to themselves or in their little black books. 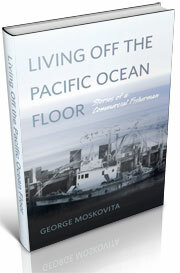 (1)Moskovita, George: Living off the Pacific Ocean Floor. Self Published Astoria Oregon, 2000. (2) Hitz, C.R., Johnson, H.C., and Pruter, A.T.: Bottom Trawling Explorations off the Washington and British Columbia Coasts, May-August 1960. Commercial Fisheries Review, June 1961, Vol. 23, No. 6 Washington 25, D.C. This entry was posted in Dayton Lee Alverson, Environmental History, Exploratory Fishing Base, Fisheries policy, Fishing, History of Science, History of Technology, Maritime History, Ocean fishing, Pacific Fishing History Project, R/V John N. Cobb, Rosefish, Sebastes rockfish, World History and tagged Astoria, Captain Gordon White, Fisheries Science, John Nathan Cobb, trawling, University of Washington. Bookmark the permalink.